Please review our wedding policy below. 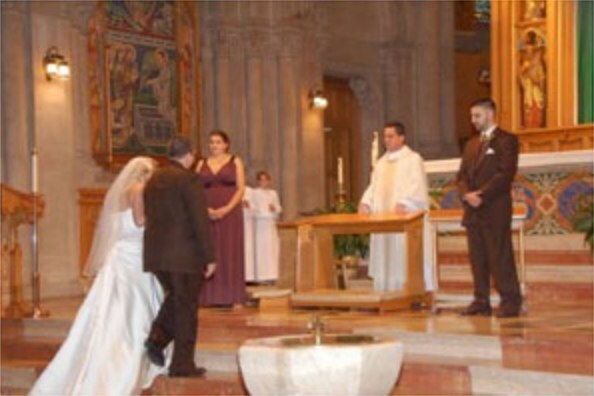 It contains all of the information about celebrating a wedding liturgy at St. Bernard parish. To view a sample wedding program click “Sample Wedding Program” below. If you were married in a civil ceremony and wish to sacramentalize the marriage, please contact one of our priests or our deacon. If you are planning to celebrate a 25th or 50th anniversary should contact the parish office well in advance of the desired date. Only registered parishioners can be married at Saint Bernard Church. The lone exception to this rule is that if one is not a member, they can still schedule a wedding as long as their parents or grandparents belong to the parish. To become a member, one needs to live within our parish boundaries. If one lives outside of our boundaries and desires to become a member of our faith community, they need to furnish a letter of permission from the pastor of the territory in which they live. Once we receive that letter from their pastor, they are free to join. New members who live outside of St. Bernard territory cannot begin the wedding process until they have been an active member for one year. For privacy, this area is password protected. Please contact your celebrant or the Director of Music to obtain the necessary password. Click here to enter the wedding music planning guide.